Eggs! 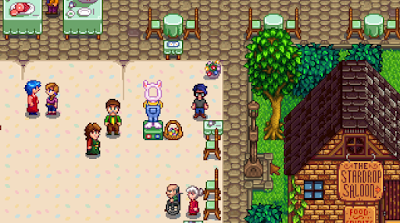 Your first holiday special in Stardew Valley is the Egg Festival, a yearly tradition that will have you rushing around Pelican Town in a mad scramble for eggs - and a lovely, straw prize. The Egg Festival takes place on the 13th of Spring every year, and starts at 9 am. During the first three hours of the day you will not be able to access Pelican Town, so if you plan on joining in you should spend that time prepping your farm - watering plants, dealing with animals, etc. If you don’t plan on attending you won’t be able to access the town for most of the day. So long as you pick up nine eggs or more during the Egg Hunt you’ll win the prize, netting you a Straw Hat. Otherwise, Abigail wins. The end of the Egg Hunt marks the end of the Egg Festival, and you’ll be sent back to your house at 10 pm. If you haven’t performed your daily chores, now’s the time. See you next year! If you win when you already have the straw hat, you get 1000 gold instead. How do i start egg hunt?